I got a little carried away with this sketch. I made into a 12x12 scrapbook page. It just seemed like the perfect sketch. I have actually bene inspired to make 3 more lay outs based on this sketch. Some times you just get on a roll. Check back later this week for the rest of the pages. This is a sweet keepsake project Kimmie!! I love your adorable image and your design!! thanks for the inspiration and for sharing. Great take on this week's sketch!! Thanks for visiting me this week and your kind comments. You got yourself a very cute kids 6th Birthday card, a hard to find those and you done it up beautifully, a treasure. ~ Jane. Kimmie, great take on the sketch challenge. 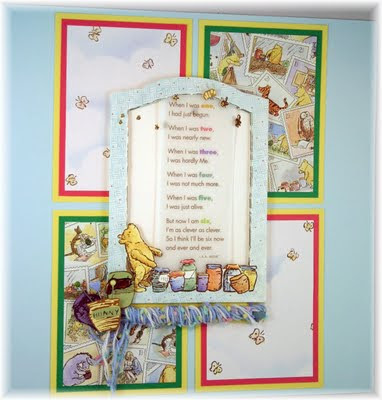 Love all of the details, in your Winnie the Pooh treasure! Kimmie, what an adorable layout this is! I just love winnie the pooh and you have made it look so cute with the little ribbon embellishment! This is so adorable! And surprising! I always see you making such edgy...va va va vooooom cards. It's fun to see you change it up this week! Well done!!!!! Hello Kimmie - what a great Scrap Layout - the MMSC is perfect for these - inspiring in so many ways! I love this 'Pooh' page - just gorgeous - it makes me want to do a layout now!! I look forward to seeing your other pages - thank you so much for sharing and inspiring every week!! God bless you!